As your parents continue to age, your concerns tend to increase. You cannot be with them 24/7 and most aging adults enjoy their independence. However, it is always a good idea to have a safety net during times they are alone. A medical alert system is a great option for seniors. Following, are 5 reasons why you should get a medical alert system for your aging parents. You will also find different success stories involving medical alerts. Popularity of Falls: One of the most common injuries among older adults (age 65 and over) are falls. According to Centers for Disease Control and Prevention, falls are the leading cause of fatal and nonfatal injuries. One in every three adults falls every year. “In 2013, 2.5 million nonfatal falls among older adults were treated in emergency departments and more than 734,000 of these patients were hospitalized.” There are several outcomes that can come from these falls. Falls can lead to broken and fractured bones, lacerations and brain injuries. This is why receiving medical attention immediately is so important. With a medical alert system, your loved one can receive help in a timely manner. Peace of Mind: Worrying about your aging parents is very stressful. By having a medical alert system, you can focus on other things knowing your loved ones are monitored 24/7. It also gives the older adults confidence. Many seniors have a fear of falling or being stuck in situations. They can live their day as they please with the comfort of knowing they are safe if anything happens. Medical Records: Some emergencies affect the ability to communicate. This is extremely important with older adults. Many aging parents have medical problems, such as, diabetic, risk of strokes or allergies. The medical alert monitoring station will have this on file and relay it to the first responders. Comfort and Ease of Use: Over time, medical alert systems have changed to more comforting designs. Devices are easily worn on the wrist or neck. They are waterproof and have a battery backup. There is no need for your parents to memorize numbers or find their phone. All it takes is a push of a button to get the care you need. New ones can even work with cellular towers and go anywhere that there is cell service. ← How Do I Set the Date and Time on an ADT Alarm System? 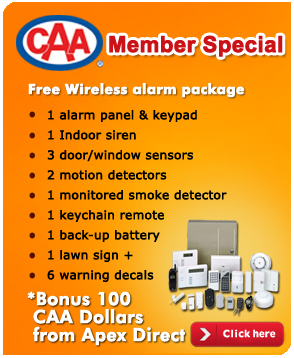 I am a CAA Member and I want to take advantage or find out more about this exclusive offer. I am a VISA Card Holder and I want to take advantage or find out more about this exclusive offer. How Do I Set the Date and Time on an ADT Alarm System? CAA and Visa offers are not available in all areas please call 1-888-496-9488 for current promotions in your area. "Minimum $99 customer installation charge,your actual installation cost may vary depending on options chosen. 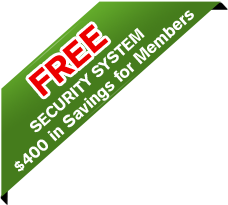 Requires a 36-month monitoring agreement starting at $29.99 per month($1,079.64). Form of payments must be by creditcard or electronic charge to your chequing or savings account. Offer applies to homeowners only.Local permit fees may be required. Satisfactory credit history required. Certain restrictions may apply. 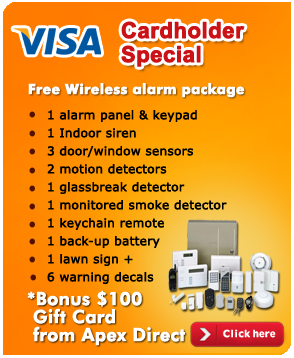 Offer valid for new ADT Authorized Dealer customers only and not on purchases from ADT Security Services Canada,Inc. Other plans available. Cannot be combined with any offer." © 2019 apexdirect.ca All rights reserved. | Site Designed by New Earth Marketing.